Federal Law Enforcement 380 ACP Auto Ammo 90 Grain Hydra-Shok Jacketed Hollow Point for sale online at cheap discount prices with free shipping available on bulk 380 ACP AUTO ammunition only at our online store TargetSportsUSA.com. 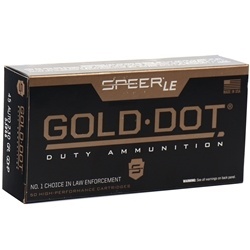 Target Sports USA carries the entire line of Federal Law Enforcement ammunition for sale online with free shipping on bulk ammo including this Federal Law Enforcement 380 ACP Auto Ammo 90 Grain Hydra-Shok Jacketed Hollow Point. Federal Law Enforcement 380 ACP Auto Ammo 90 Grain Hydra-Shok Jacketed Hollow Point review offers the following information; For nearly a century Federal Ammunition has put its focus on manufacturing quality products with cutting edge technology. This dedication to excellence has given Federal a competitive edge as an ammunition technology giant. Today the company is well known for producing high grade centerfire, rimfire, and shotshell ammunition that shooters everywhere know and trust. Federal Law Enforcement 380 ACP Auto ammunition is a new production ammo that features 90 Grain Hydra-shok Jacketed Hollow Point bullet, is re-loadable, features nickel plated brass cases and Boxer primers. 380 ACP Auto ammo made by Federal is non-corrosive. Law Enforcement ammo is the perfect choice for personal protection, whether it be for a concealed carry option or to defend your home against potential threats. You can count on Federal ammo to get the job done and keep you prepared for anything when it matters most. the mostFederal Law Enforcement 380 ACP Auto ammo has a muzzle velocity of 1000 feet per second and a muzzle energy of 200 ft lbs. Law Enforcement ammo comes packaged 50 rounds per box and 1000 rounds per case. Order a case of bulk 380 ammo to receive free shipping from Target Sports USA. 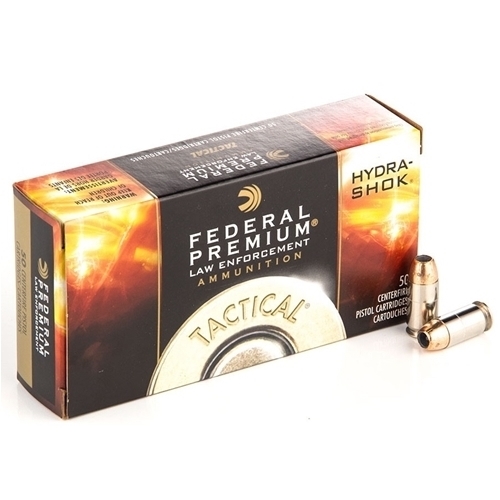 Federal 380 ACP Auto ammunition is a new production ammo that features 90 Grain Hydra-shok Jacketed Hollow Point bullet, is re-loadable, features nickel plated brass cases and Boxer primers. Law Enforcement ammo is the perfect choice for personal protection, whether it be for a concealed carry option or to defend your home against potential threats. Law Enforcement ammo comes packaged 50 rounds per box and 1000 rounds per case. Not a fan of the caliber but this cartridge works quite well in the LCPII. Expansion and velocity as expected. For short barreled 380 autos this is my preferred carry ammo.